Road construction contractors and maintenance companies along with state and city agencies are legally responsible to ensure the construction work sites are safely designed. The law requires the government agencies and roadway cruise follow specific rules to channel or redirect vehicular traffic through the zone. Sadly, a construction zone accident is a common occurrence in Rhode Island and Providence Plantations and across the United States. When a construction zone has not been properly designed in Rhode Island and Providence Plantations, motorists can become easily confused and cause accidents with injuries or deaths when colliding with concrete barriers, construction equipment, workers or other vehicle sharing the roadway. Unfortunately, construction works zone accidents in RI happen far too often, causing serious injuries and fatalities to workers, drivers and passengers. Most of these accidents occur in construction zone areas with posted signage and warnings that provide a notification to motorists to travel at a slow speed while increasing their awareness. Even with signage, many motorists fail to adjust their driving habits to accommodate the hazardous zone, creating a dangerous situation to all workers and other sharing the roadway. Out of the more than 80,000 accidents occurring in work zones every year, more than 100 workers lose their lives at roadway construction sites. According to the CDC (Centers for Disease Control and Prevention), these accidents injure and kill highway maintenance workers, construction laborers, supervisors, construction equipment operators, commercial truckers and heavy equipment drivers along with motorists and passengers traveling the roads. • Defective Paving – Many accidents occur from the steep drop off that can cause the motorist to lose control of their vehicle on the shoulder or road surface. • Improper Planning – A roadway crash can occur from an ineffective, negligent MOT (Maintenance of Traffic) plan developed by road architects and highway engineers designed to move traffic safely and effectively through the construction work zone. 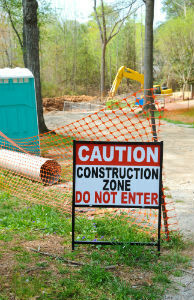 • Ineffective Marking and Signage – Driving a car through a construction work zone can be challenging or impossible when negotiating the vehicle through improperly marked or signed sites. • Failure of Regulatory Compliance – Construction project managers are required by law to meet every local, city, state and federal regulation. Any failure of a regulation that causes an accident with injuries or death can make those in noncompliance legally at fault for damages. • Construction Defect – If the road contractor failed to construct the highway road project as designed in the approved plan, the company can be held legally responsible for any injury or death. While it might be obvious that the accident is a result of poor construction zone design or the negligence of other drivers, proving the case for compensation can be challenging. This is because determining liability or which parties are at fault for the accident can be difficult. Because of that, many victims will hire a East Providence personal injury attorney who specializes in construction work zone accidents. Successful claims and lawsuits often involve identifying whether the contractor, municipality or other parties are responsible for the victim’s damages. An experienced RI injury lawyer will carefully investigate the scene of the accident, identify companies and individuals whose negligence caused the injuries and file suit to pursue fair and adequate compensation to meet the financial needs of the injured victim. In addition to motorist becoming injured at a construction works zone site, workers in Rhode Island are also vulnerable to death and serious injury. Many work zone related deaths in Cranston, Warwick, Pawtucket and in RI occur from an adequate protection or negligent driving of others. Typically, these types of cases are handled on contingency, so the victim can avoid paying upfront fees. A reputable Rhode island personal injury attorney or Rhode island car accident lawyer will work to ensure adequate compensation is obtained to cover their client’s medical expenses, lost time away from work, pain, suffering and other damages. RI Favorable Legal Environment For Injured Victims & Attorneys!